In a move that has upset the Greeks, Alexander the Great has made a huge comeback in Macedonia. A giant statue bearing an uncanny resemblance to the warrior king – although, officially, no one dares call it that – has been erected in the heart of Skopje, Macedonia’s capital. Seated upon his favourite steed, the classical hero surveys the capital from the vantage point of Plostad Makedonija, Skopje’s central square. At 22 metres, or eight storeys high, the statue dwarfs its surroundings. But, then, that is the idea. Amid great clouds of dust, giant bulldozers perpetually gnaw at the ground as the former Yugoslav republic undergoes one of Europe‘s biggest urban renewal schemes. And it all takes place against the backdrop of a 20-year-long dispute with Greece, its southern neighbour, over ownership of the name Macedonia. The sculpture, part of a building bonanza that has also erected gothic edifices, grandiose bridges and a triumphal arch, has been billed as the project’s crowning glory. For the overtly nationalist government in Skopje, the overhaul is more eloquent than any other propaganda tool in its long battle with Greece over the country’s name, and the right to claim Alexander as a national hero. With Greece in economic crisis, it couldn’t come at a better time. “This is our way of saying [up yours] to them,” Antonio Milososki, the state’s former foreign minister, told the Guardian in an interview in October 2010. Greece has long held that the desire of their Slav neighbours to call themselves Macedonian conceals territorial ambitions over its own adjacent province of Macedonia. Since the landlocked country’s proclamation of independence in 1991, Alexander the Great has been at the centre of the controversy. The statue is the former Yugoslav republic’s biggest claim yet to his legacy, though in recent years Skopje has also named its airport and highway after him. Re-elected this year as prime minister, Nikola Gruevski, a hardline nationalist who started out as a bank clerk before turning to politics, has pursued the building programme with gusto, ordering a new archaeological museum, national theatre, philharmonic hall and scores of rococo building facades and sculptures to be erected at record speed. A statue of Alexander’s father, Philip of Macedon, is, at 28 metres, expected to be even taller than that of the warrior king. But the administration has been hesitant about releasing costs for the project, conservatively estimated at more than €200m. Most people, according to polls, regard the campaign as overly kitsch, even if some also think it brings a little joy to the dullness imposed on the capital by communist apparatchiks after Skopje was levelled by an earthquake in 1963. With unemployment nudging 35%, and at least a third of the population living below the poverty line, the scheme has provoked violent protests and grassroots opposition. But across town, in the communist-era headquarters of the Macedonian Academy of Arts and Sciences, Professor Blaze Ristovski disagrees. The silver-haired academician has spent a lifetime studying the history of his beloved country and for him the statue-building amounts to a “very useful” exercise. Internationally, the mini-state is still forced to call itself the Former Yugoslav Republic of Macedonia – the title it was given by the UN shortly after independence – even if 132 countries have recognised it as the Republic of Macedonia, its constitutional name. Greeks refer to their neighbour as Fyrom, with its citizens often called Skopjians, though there are signs Greece is shifting its stance. Recently, the Gruevski government stopped referring to the statue as Alexander the Great, preferring instead “warrior on a horse”. A breakthrough, perhaps. What is certain is that the Greeks are watching – closely. This article was amended on 15 and 17 August 2011. A reference to the main stadium in Skopje being named after Alexander the Great has been removed, as the stadium was named after Philip II. This article also said that Skopje was levelled by an earthquake in 1953, and that 120 countries recognise it by its constitutional name of the Republic of Macedonia. This has been corrected. In addition, it said that the state’s former foreign minister spoke to the Guardian in a recent interview. This too has been corrected. Posted by Yilan in Macedonia, Yunanistan. Workers lift a massive statue of Alexander the Great on his horse Bucephalus in Skopje ‘s Central Square on June 21. The statue, whose installation in the square is part of a cultural project “Skopje 2014,” is 12.5 meters high and stands on a 10 meter pedestal. There was a cultural event in Skopje that would not for a moment draw the world’s attention from much more important events — such as the uprisings in Syria and Libya — for example, if it did not have such an intense political background, connotation and reaction. 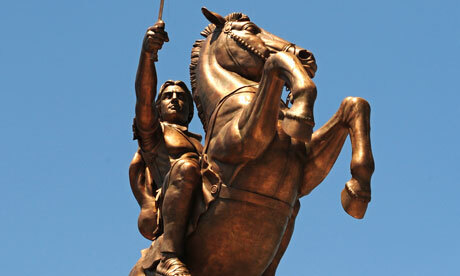 A giant statue of an ancient warrior on a horse was erected in the main square of the Macedonian capital on June 21. It was greeted with an ecstatic welcome from thousands of Macedonians present at the square and caused a great deal of anger in neighboring Greece. There was another attraction in the event as well; nobody officially said who the huge equestrian statue represented and in other circumstances it might be one of those “unknown soldiers” that many countries have dedicated national monuments to. In this case, however, the image and appearance of a warrior cast in bronze was well-known to everybody and it was easily recognized as the figure of Alexander the Great, whom both Macedonians and Greeks consider their primeval ancestor. There is no doubt that Alexander was a great historical Hellenic figure, but that does not mean that everything that was Hellenic belongs to modern Greece. What might be said for numerous historical sites in Anatolia and the Middle East that belonged to the promising Hellenic centuries? Greeks long ago gave up the “Hellenism” of those areas and now go to these destinations as tourists, proud they were once part of that common civilization. The cause of Alexander and Macedonia is, of course, different and it was created in modern times when Ottoman treatment of the Balkan ethnicities was altered by the rise of local nationalism and conflict, even wars among themselves. Thus, the identification of Alexander the Great as more or less Greek or Macedonian, is an invention of the modern nationalistic movements. Alexander was the son of the Philip II the Macedonian, but he himself could not be regarded as being just Macedonian or Greek. He belongs to both contemporary Greece and Macedonia, by way of his Hellenic blood or by his Macedonian land and ancestors. He belongs perhaps even more to the whole world, despite being regarded as a bearer and messenger of Hellenic civilization or a cruel invader and destroyer of more ancient ones. It is not important that I personally believe the latter and that the West’s prevailing negative view of the old Eastern peoples and cultures was created by biased and prejudiced ancient Greek historians. At this very moment it is important that modern Macedonia had the right to raise a monument to Alexander the Great if it were done on a more modest scale, in a less striking place in their capital, at a less challenging time and — what is perhaps even more important — if it were not done in reaction to the persistent two-decade-long Greek refusal to recognize the name of the Republic of Macedonia, which the parliament of that country adopted and two thirds of the UN member-states accepted. However, due to Greece’s rejection of the name and right to veto in the European Union, Macedonia — in all international organizations and official events, even sports-related ones — still bears a long and strange name: “the former Yugoslav Republic of Macedonia” (FYROM), which was adopted as a precondition for the country’s recognition and acceptance to the UN. It is ironic that Yugoslavia has disappeared from the Balkan map, but its name still appears in the name of a country that, similar to other former Yugoslav republics or any other country in the world, deserves the right to name itself by the will of its people. In spite of UN-led negotiations, two countries have not been able to solve the name dispute. Greece hardly accepts Macedonia having the same name as its northern province. 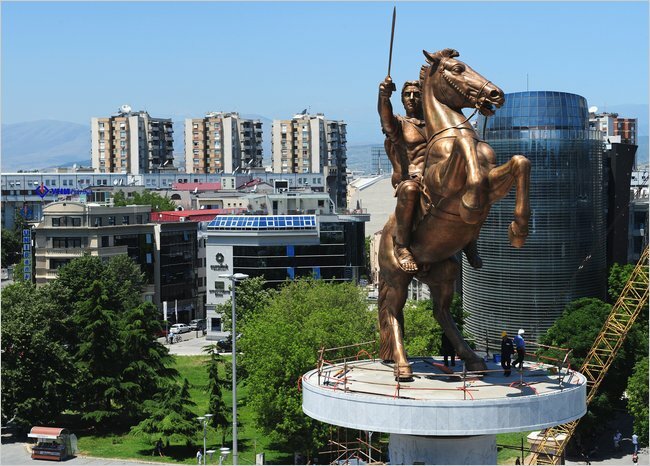 The erection of the 13-meter “Warrior on a Horse” statue might be a mark of the Macedonian Prime Minister Nikola Gruevski’s victory after the early elections held at the beginning of June. Known for his uncompromising approach towards the name dispute with Greece, he did something similar after his party won elections five years ago, naming the Skopje airport after Alexander the Great, as well. That also irritated Greece. Gruevski’s party — whose name is as complicated as the country’s name, the Democratic Party for Macedonian National Unity – Internal Macedonian Revolutionary Organization (VMRO-DPMNE) — has roots in the 1893 Macedonian patriotic revolutionaries’ movement, whose sole aim was “liberating the Macedonian people from the Ottoman yoke.” It is today a Christian Democrat and anti-Communist party, ethnically based and claiming that “the party’s goal and objectives express the tradition of the Macedonian people.” It won 37 percent of a total 1.1 million votes. If he did not place a huge monument to Alexander the Great in the center of Skopje, I would be able to understand Prime Minister Gruevski’s persistence regarding the name of his country. The name itself might perhaps be compromised if Greece stops using it as a reason to block Macedonia’s bid to join the European Union and NATO, as that was the only reason it did not become a member of the Euro-Atlantic integrations. When all NATO member states, except Greece, agreed to offer Macedonia membership at the alliance’s summit in Bucharest in 1998 and the US applied additional pressure in that regard, thereby recognizing Macedonia by its constitutional name, the invitation was called off at the last moment. It is thus possible that the Macedonian prime minister is using Alexander the Great as a tool to gain support for his party with a nationalistic background, diverting people’s attention from the bleak economic situation in a country with a current unemployment rate of at least 30 percent. One could also easily agree with London’s The Economist, which said that unveiling the Alexander statue in Skopje might give George Papandreou’s government in Athens a chance to divert attention from the catastrophic financial situation in his country, but I would hardly agree with the esteemed magazine’s conclusion that “everyone else will assume this is just more Balkan-flavored craziness.” It is a well-known story about the Balkans that it is as a “barrel of gunpowder.” Wouldn’t it also be “craziness” to use an old-fashioned veto to block access to the UN and NATO for a country that has fulfilled all conditions except its name, which its people and representatives have chosen and most of the world countries have accepted? Although it is another subject to be reviewed on another occasion, there is also reason to question whether the name dispute between Macedonia and Greece is part of the ongoing different approach and even different strategy of the US and leading EU member states toward Balkan issues, which we in Bosnia and Herzegovina are witnessing these days as well. *Hajrudin Somun is the former ambassador of Bosnia and Herzegovina to Turkey and a lecturer of the history of diplomacy at Philip Noel-Baker International University in Sarajevo. Statue of Alexander the Great in Macedonia. A crowd of several hundred people gathered in Skopje’s central square to watch the lifting of the 30 ton bronze statue. It depicts Alexander the Great on his mighty stallion Bucephalus. The statute is 92 feet tall from the bottom of the pedestal to the tip of alexander’s raised sword. Stoyanov was impressed by more than the artistry. He approved of the symbolism. Greece claims Alexander the Great as its ancient hero. But what is today Macedonia, was once, along with parts of Greece and Bulgaria, one geographical territory. And Macedonians like Stoyanov say the statute of Alexander the Great represents their cultural heritage and future. “With this statue we are showing the world that Macedonian has existed, it still exists, and it will continue to exist. The Macedonian people can never be destroyed. We have roots.” Stoyanov said. If many Macedonians sound insecure about their identity, they have reason to be. Greece accuses Macedonia of trying to appropriate its history. In fact, Greece insists that Macedonia change its name. But Macedonian cultural anthropologist Aleksandar Ristevski said his compatriots have already done more than enough to appease the Greeks. “We changed our flag, we are calling ourselves internationally the former Yugoslav republic of Macedonia, mentioning a country which doesn’t exist for 20 years using some idiotic acronym. We changed the constitution because of them. We changed millions of things. What did we get? Blockage, degradation and sanctions,” Ristevski said. Still, Greece is blocking Macedonia’s bid to join the European Union and NATO unless it changes its name. Macedonian Zoran Iliev urges his countrymen to stand firm. It’s that kind of nationalist fervor that provided the backdrop for the construction of the statute of Alexander the Great. Macedonians consider Alexander their heroic native son. And anthropologist Vasiliki Neofotistos of the State University of New York at Buffalo said that means a lot to this beleaguered but proud nation. This week’s completion of the statute of Alexander has angered the Greeks further. But more than one Macedonian pointed out that Greece has its own problems to deal with these days. In the view of many here, the neighbors have been bullying this little Balkan country for a long time. A 30-ton statue of Alexander the Great in Skopje, Macedonia. Bulgarians see its people as Bulgarians with accents. Serbia used to consider the land Southern Serbia and refuses to recognize its church. Greece accuses the country of nothing less than stealing its name, history and national symbols. This week, Macedonia pushed back. 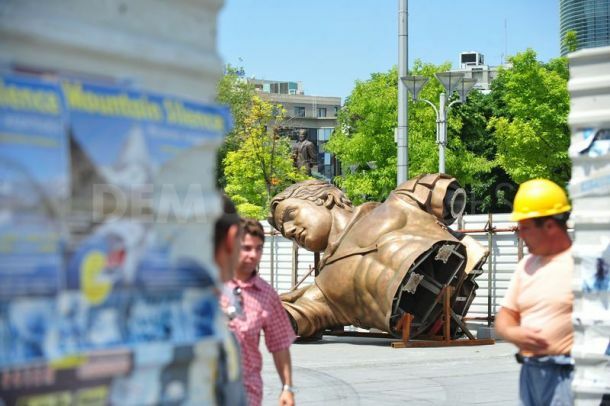 In a precisely calibrated display of political and civil engineering, workers lifted a 14.5-meter, or 47-foot, bronze statue of Alexander the Great, weighing 30 tons, and placed it on a 15-meter-high pedestal in the central square of Skopje, the capital. This is no mere philosophical dilemma. Macedonia has been stuck in one of the most intractable disputes of the post-communist world: Greece has held international relations hostage for 20 years because it considers the name Macedonia an appropriation of its own Hellenic identity and its northern province of the same name. If it can’t have riches, Macedonia, a country of two million with 31 percent unemployment, wants recognition. Playing up ties to an ancient global celebrity resonates with people who feel they have been marginalized for centuries. “We are proud of Alexander,” said Petko Bozhinovski, 48, who wore a black T-shirt with the Macedonian flag as the statue was raised Tuesday to the applause of several hundred bystanders. “Finally, our Alexander has come back to his homeland,” he said. The project is controversial — it cost €9.4 million, or $13 million. But some things, say statue fans, are priceless. “If you lose your identity, you are a nobody,” said Alexandar Ristevski, 32, an ethnographer. Macedonia was promised an invitation to join NATO in 2008, but this was vetoed by Greece because the name issue was unresolved. In 2005, Macedonia also became a candidate for the European Union, but still has no date to start accession talks because of Greek resistance. Mr. Lambrinidis said Greece had proposed a name with a geographical qualifier to settle the dispute. The Macedonian Foreign Ministry declined to comment. When Macedonia declared independence from Yugoslavia in 1991, Greece immediately protested the name and flag — accusing the new country of staking claims to Greek territory and of trying to separate ancient Macedonian civilization from Hellenic culture. Athens refused to recognize its northern neighbor and organized an embargo. The two countries signed an interim accord in 1995 under which Macedonia would be referred to internationally as the Former Yugoslav Republic of Macedonia. In exchange, Greece lifted its embargo, recognized this provisional name and agreed not to block membership in international institutions. Almost 16 years later, both sides are still negotiating a new name. They have indicated they might consider a geographical modifier of Macedonia, such as Northern Macedonia — favored by Greece — or Macedonia (Skopje), which the Macedonians like. Meanwhile, Macedonia has filed suit with the International Court of Justice in The Hague against Greece, accusing it of violating the 1995 agreement. A decision is expected in September. The statue is part of a controversial facelift for Skopje — a city whose old center was flattened in an earthquake in 1963 — including 15 new buildings, the renovation of old ones and a triumphal arch. The government estimated the bill for renovation at €80 million in 2009, but the opposition says costs have already risen to €200 million. No official figures are available. The government of Prime Minister Nikola Gruevski has also given Alexander’s name to the airport in Skopje, a highway and a stadium. The inauguration of the Alexander statue is expected on independence day, September 8. “This attempt to rebuild the Macedonian nation is definitely destroying the chances for compromise” with Greece, said Vladimir Milcin, executive director of the Open Society Foundation Macedonia. Mr. Milcin noted that the European Union’s enlargement commissioner, Stefan Füle, called the statue a “provocation” and suggested for the first time that Macedonia’s move toward Europe was going backward. But neither Mr. Milcin nor a Western diplomat who insisted on anonymity thought this would deter the prime minister. “It’s just adding fuel to his power and image that he is the final and only defender of Macedonian name, identity and culture,” Mr. Milcin said. Macedonia’s identity politics are further complicated by the restive 25 percent of its population who are ethnic Albanians. In 2000, the ethnic Albanian National Liberation Army fought a six-month war against the majority. The lure of Macedonian lore has grown in recent years. Alexander has helped buttress the nation against the trauma of the free market, political strife and independence, said Pasko Kuzman, an archaeologist with the Ministry of Culture. A statue of a ‘warrior on horseback’ resembling Alexander the Great, currently being erected in the centre of Macedonian capital Skopje, has sparked fury in Greece, which warned that Skopje was gambling with its EU membership aspirations with such provocations. Macedonia, an impoverished EU candidate country, has reportedly spent several million euros on the statue of a Hellenic warrior resembling known images of Alexander the Great, a king of Macedon from the fourth century BC who built the largest empire in ancient history. Macedon was a small empire which under Alexander’s reign extended its power to the central Greek city-states and even as far as the Himalayas. Anticipating fury from Athens, the government in Skopje dropped plans to name the statue after Alexander the Great, the local press reported. Instead, the monument, which is still being assembled in a central Skopje square, is officially referred to as ‘the warrior on horseback’. Nevertheless, this did not prevent a Greek government spokesperson from labelling the artistic effort “risible” and directly accusing Macedonian Prime Minister Nikola Gruevski of “making provocations to avoid reality”. Greek Foreign Ministry spokesman Gregory Delavekouras said that under other conditions, his country would be “honoured by the decision of the government of the Former Yugoslav Republic of Macedonia to spend nearly €10 million to honor Alexander the Great, placing a statue of the Greek army commander in a central square in Skopje”. “But the ‘archaisation policy’ that this action is part of is […] essentially based on the effort to usurp Greek history with a view to cultivating nationalism and conflict,” he claimed. Delavekouras also stressed that the statue project undermined bilateral relations and was hampering negotiations, led by the UN, to find a solution to the long-standing name dispute pitting Athens against Skopje (see ‘Background’). Greece does not recognise Macedonia by its constitutional name, and so in international fora in which Greece participates, Macedonia is called ‘the Former Yugoslav Republic of Macedonia’. “While Greece is pursuing the achievement of a solution consistently and in a constructive spirit, Mr. Gruevski is making provocations to avoid reality, undercutting his fellow citizens’ European future. He needs to get back to reality right now and work sincerely and seriously towards achieving a solution. Otherwise, he will bear responsibility for his country’s back-sliding,” Delavekouras warned. The Greek official added that Athens would inform its partners and allies, as well as international organisations, of this provocative action. He warned that consequences should be expected with regard to “FYROM’s Euroatlantic perspective”. ”Following the election, Prime Minister Gruevski stated his commitment to pursue Euro-Atlantic integration and to resolve the name issue. All main political parties consider this issue their priority as well. Therefore we expect the prime minister to provide leadership and focus energies of the country on finding a negotiated and mutually acceptable solution together with Greece. Skopje daily Dnevnik cites Sashko Todorkovski, an expert on international affairs, as doubting that there is any other place on earth where a monument to Alexander the Great has been built that the Greek authorities have complained about. As no record of such complaints exist, Todorkovski concludes that Macedonia is being discriminated against. “It appears that everyone can build a monument to Alexander except us,” the expert is quoted as saying.